A few months ago my four-year-old daughter started kindy. Although she likes it, she is incredibly shy and finds it difficult to interact with other children (so says the teacher). What can I do to help her to be more confident and outgoing? Kids that are shy really just need a bit more confidence and practice. Social confidence is a skill. As a skill it certainly can be learnt, and improved with the right teaching and a lot of practice and some helpful hints as they go. Being able to talk to other kids, ask them to play, join in with them and their games and be liked in return involves a whole series of steps. Even as adults, you will be able to think of your friends, family members or people that you meet everyday in life who have these skills, make others feel comfortable and those who struggle. As a parent you really don’t want your child to struggle with anything, so yes, you certainly can help guide your daughter in the right direction. Firstly I would start simply at the bottom of the list of social skills that children need to master. The first is eye contact. 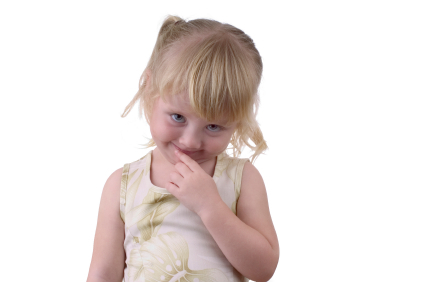 You will have noticed that your daughter at kindy probably looks at the floor when she first walks in or when the teachers say ‘hello’ or other kids talk to her. She is really hoping that they won’t notice her and is feeling self conscious, what she doesn’t know and understand if the effect that it has on the other kids. Then talk to her about how when you and her talk to each other you use eye contact, you look each other in the eye. Show her how this works. Practice. Then show her what it is like if you look at the floor when she says ‘hello’ to you or is talking to you. Ask her what it feels like to her? Act this out a few times, so that she understands. The next step is to say, tomorrow when we go to kindy then just try to look the teachers or the other children in the eye when they talk to you or you see them. At this point, do not ask her to add words as well – like make sure you say hello. This would be the second step once she has done the first step of just making eye contact. As you walk into kindy the next day, just gently remind her about the eye contact, without pressuring her. If she manages to make eye contact or just tries to, be sure to notice it and smile or praise her about it a little later. Once she has managed the first step then the second is to smile and say hello. The third to look, smile, say hello and use the person name. I’m sure you are starting to get the sequence. Above all no pressure to perform or nudging of ‘ say hello’ etc this just makes kids freeze even more. As I mentioned before this is just the first social skill of the list, if you are interested in reading more I will put the whole list up on my website called 'social skills' as well as a few more tips on how to help with confidence.